Disc golf history was made on Friday, March 1st 2013. At 5pm EST, Discraft began accepting retail orders for the Ten Year Anniversary Edition Buzzz midrange, a limited edition collector's run capped at 10,000. Ten minutes later, anxious buyers who were a little slow were met with a "Sold Out" notice. "I couldn't believe it was happening," said one disappointed disc golf retailer, who asked to remain anonymous. "My customers have been calling about this disc for weeks, and my Internet connection went down just before five o'clock. I may have to buy some off the auction sites now just to make sure I can take care of my best customers." Discraft was forced to cut off further orders after only ten minutes due to an overwhelming response, despite a general limit of 50 discs per retail customer. "Ten thousand Ten Year Buzzzes in ten minutes. We expected to sell out quickly, but we were initially thinking more like ten hours," said Discraft disc golf sales manager Erich Sitler. "It became clear right away that we needed to shut down to avoid overselling." Sitler went on to note that orders that were accepted might not be filled, as retailers were alerted to the first-come, first serve policy on this disc. "We are processing and shipping out the orders now, and ask retailers not to contact us about their order until the end of the week when we will have a better idea of where we stand." The Discraft Buzzz is widely accepted to be the world's most popular golf disc. Released in 2003, it's popularity grew quickly as a do-all utility disc for all skill levels with rock-solid flight consistency from run to run. 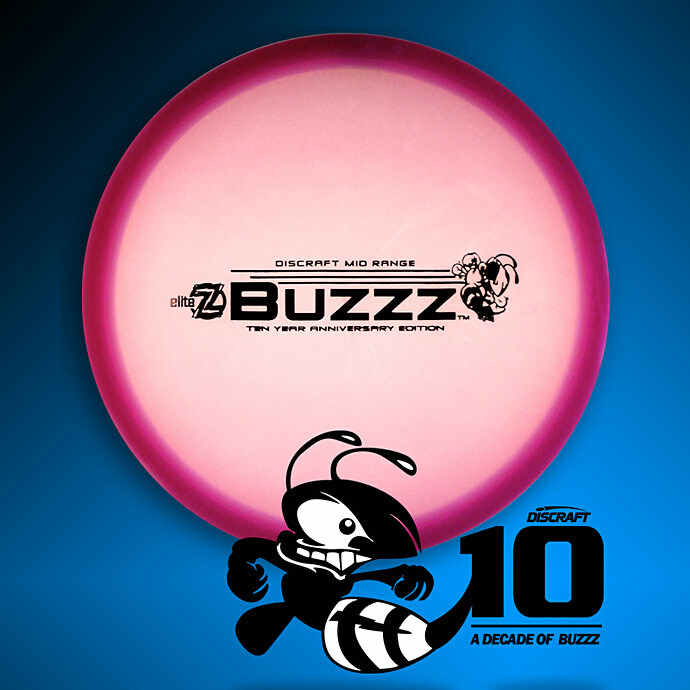 Buzzz was eventually surpassed by the Nuke driver as Discraft's fastest selling disc in 2010. The Ten Year Anniversary Edition Buzzz is being referenced as the collectible of the decade, and initial sales demand appears to be upholding that reputation. "We will be celebrating Buzzz throughout 2013," said Discraft marketing manager Brian Sullivan. "Some special short-run colors of the Ten Year Edition have been held back and will be used to help Discraft with some charity fundraisers surrounding big upcoming events, including United States Amateur Disc Golf Championship and Discraft Great Lakes Open. We've also put together some framed collector's packages that are really amazing. We can't wait to let players see them as we get into the 2013 season, it's going to be awesome." Discraft has set a retail MSRP price of $19.99 on the Ten Year Anniversary Edition Buzzz, however consumers will most likely find that demand will push prices higher. The discs will begin arriving at retailers worldwide this week.